Advances in Cancer Immunotherapy™ – Toronto, Ont. Credit information to be announced. Click here for more detailed CME, CNE, CPE and MOC information and program objectives. The 2018–2019 Advances in Cancer Immunotherapy™ educational series is supported, in part, by independent medical education grants from AbbVie Inc., Amgen Inc., AstraZeneca Pharmaceuticals LP, Bristol-Myers Squibb, Celgene Corporation, EMD Serono, Inc. and Pfizer Inc., Incyte Corporation, Lilly USA, LLC, Merck & Co., Inc., Novartis Pharmaceuticals Corporation, Pfizer Inc. and Prometheus Laboratories Inc. Participation in this free online pre-program course is strongly recommended as it contains information that was not covered at the program on April 4, 2019. 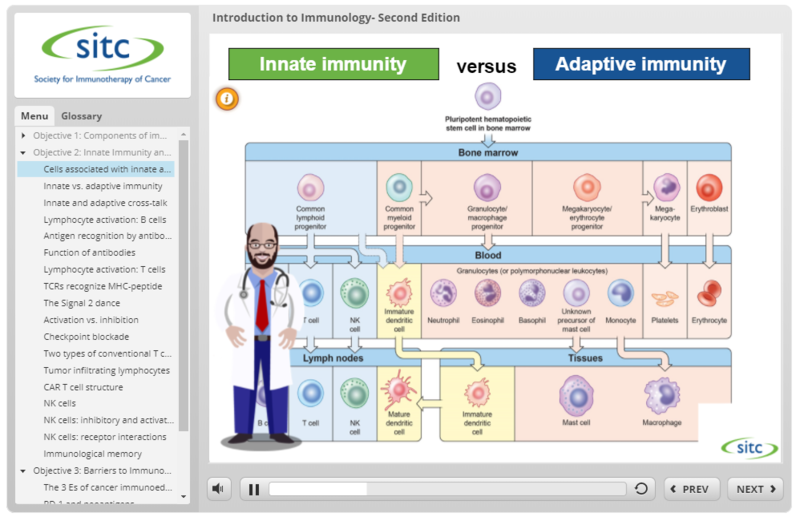 This updated, interactive course provides foundational knowledge that is necessary for understanding cancer immunotherapy content that was discussed at the in-person program. Upon completion of the course, participants can earn continuing education credits (CME, CNE and CPE credits are available).